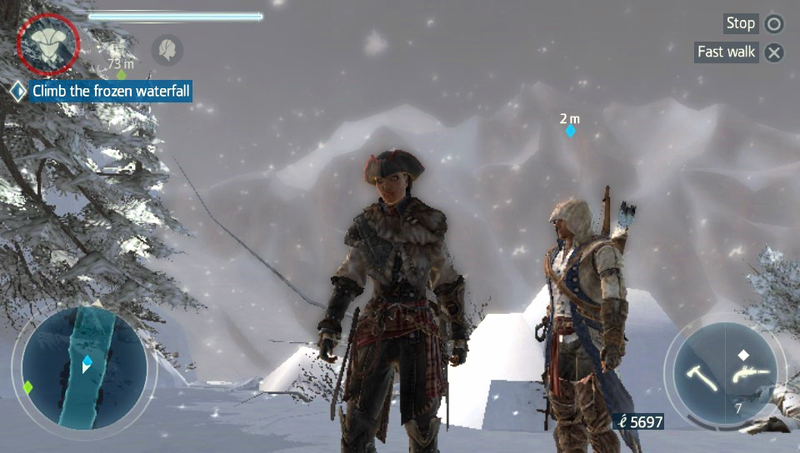 She's Fantastic: Assassin's Creed AVELINE DE GRANDPRÉ! Assassin's Creed AVELINE DE GRANDPRÉ! McFarlane Toys never ceases to amaze me recently. Between Walking Dead, Halo, and now Assassin's Creed, they have produced some of the best female action figures of the past few years. I know nothing about Assassin's Creed aside from what I read about in preparation for this review, but I know this is a beautiful toy. Aveline de Grandpré was an assassin of French and African heritage who lived in New Orleans during the mid-18th century. She first appeared in Assassin's Creed III: Liberation from 2012 and has appeared in subsequent games as well. I first became aware of this figure when a drawing of the figure was shown in the McFarlane booth at Toy Fair two years ago. (I enter that booth every year in hopes that a new line of Saga toys will be unveiled. I think McFarlane is the only modern toy company that could do that property justice.) But alas, no Saga, but I was very intrigued with this female assassin and two years later I decree she was well worth the wait. Let's check her out in detail below! The face sculpt and paint apps are just stunning. Aveline comes with a slew of cool accessories: A Hat, a Whip, a Blade, a Pistol, a Baton, and a 2-piece Wrist Blade (one piece retracted, one extended). Her articulation is plentiful and well hidden. Very similar to the Walking Dead and Halo figures we've been seeing from McFarlane Toys for years. The Pistol, Blade, and Baton holster nicely to her belts. Here is the Extendable Wrist Blade. The accessory itself does not move. But there are two separate accessories displaying both extended and retracted versions. Her cape is removeable, as is her sash. The whip is fantastic, but will need some times to gracefully form into a natural bend. It's a little oddly kinked right out of the package. 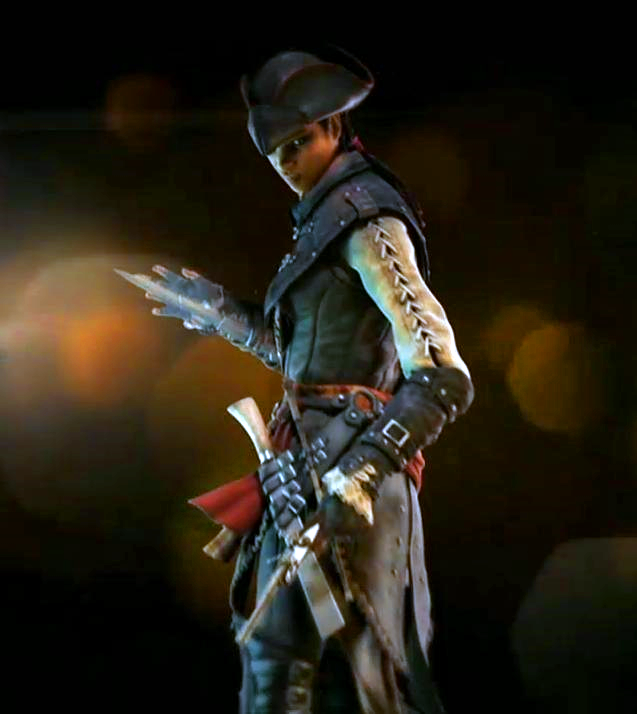 Here are some images of Aveline de Grandpré from gameplay and promotional materials. Here she is with Andrea and Maggie from Walking Dead. Aveline is of a much larger scale, but she's of the same quality and level of articulation. I have barely paid attention to this line when Iv walked past it and had no idea that there was a female in it.Im going to have to see if they have this one. I had been looking for her for months (despite all the online preorder information saying she wouldn't ship till Sept). But, right on schedule, she just showed up in one of my TRUs last Tuesday. I don't think she'll be hard to find. Now I have to find her. I have several of the male figures but like everyone else I had no idea there was a female figure in the line. She looks great. Yeah for some reason the video game toylines don't get alot of play on the major toy news sites. Like I said in the reivew, I caught a glimpse of her at Toy Fair and was seeking her out actively every since (checking out bbts pre-order dates, etc). But if it weren't for that vigilance on my part, I would have no clue she existed. There isn't enough black female figures, nevertheless of this quality. It's a must for me. Thanx for review. I totally agree. One of the first projects I tackled when starting this blog was to do a series of reviews for Black History Month. But it was very difficult because of the lack of figures (let alone ones I owned). So now everytime I review a black female figure, I tag it with a "BHM" (for black history month) so they can be associated with those early reviews.